Making meringue topping for pie from scratch is easy when you follow Grandma's old fashioned methods. No more shrinking away from the crust or weeping for your meringues. Just follow the tips and easy directions below and get perfect results. First, use fresh eggs that are at room temperature. The fresher your eggs, the greater the volume and fluffiness your meringue will have. As with anything in baking, the quality of your ingredients will reflect in your results. 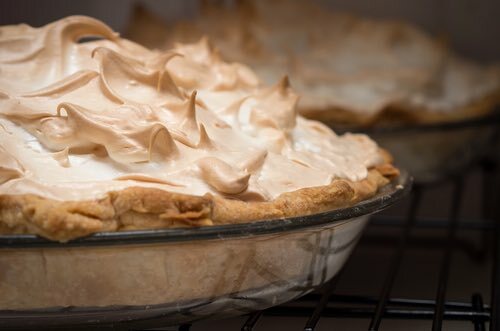 I recall that Mom always spread her meringue evenly over the "hot" pie filling from the edge of the pie in towards the center. The meringue should touch the crust around the entire edge with no openings and make a dry seal. Mom's spreading technique assures that the pastry edge is properly sealed with the meringue mixture, and the hot filling helps to cook the meringue's bottom first, which helps to further seal it before it's browned. I have noticed that some of the cooks from Grandma's day added a little cream of tarter to their meringue mixture. 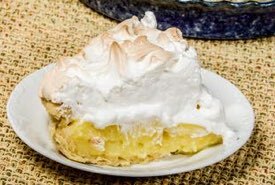 For example, in Aunt Babette's deep dish lemon meringue pie recipe, she adds 1/2 teaspoon of cream of tarter to two beaten egg whites. 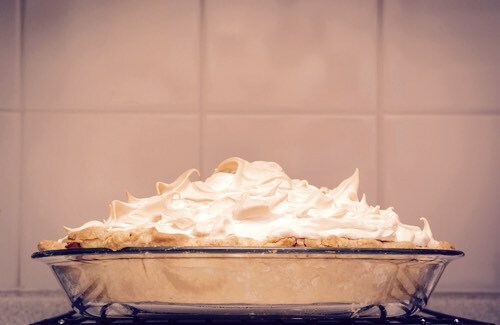 Adding a "small" amount of cream of tartar or vinegar or lemon juice will give the meringue added stability. Some also added a tablespoon of cornstarch to their meringue topping. It helps to prevent the egg whites from over coagulating, ensuring a softer meringue. The cornstarch should first be dissolved in a very little warm water and beaten into the meringue after the sugar has been beaten into the whites. 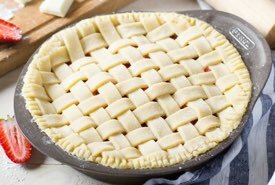 The added cornstarch also helps to thicken and stabilize the meringue so that it seals well, shrinks less, and cuts perfectly. It keeps the meringue firm and not soggy, which is important if you're making it in hot, humid weather. There's an old saying, "Never make meringues on a damp day." Be aware that the sugar will absorb moisture from a humid kitchen and affect the meringue's result. 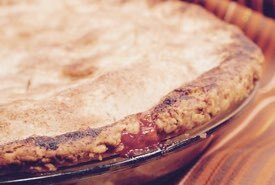 Undissolved sugar will make a meringue pie weep droplets, so either use a finer granulated sugar or beat until it's all dissolved. Two tablespoons of sugar per egg white is the usual ratio for good results. The finer the sugar, the softer the meringue. Also, don't have your oven too hot and be careful not to overcook, as overcooking will cause beading, those wet sugary drops that sometimes appear on a baked topping. The meringue will brown at 260°F to 300°F (125°C to 150°C) just fine. This all helps to prevent your meringue from weeping and shrinking away from the crust. You'll take great pride in serving your homemade pies crowned with a perfect, golden-baked meringue just like Grandma's. You can make an easy meringue in a hurry simply by adding a tablespoonful of white sugar to the beaten white of one egg. Spread over the top of a pie or dessert and slightly brown in the oven. To ice pastry, which is the usual method adopted for fruit tarts and sweet dishes of pastry, put the white of an egg on a plate and with the blade of a knife beat it to a stiff froth. When the pastry is nearly baked, brush it over with this and sift over some pounded sugar; put it back into the oven to set the glaze and in a few minutes it will be done. Great care should be taken that the paste does not catch or burn in the oven, which is very liable to do after the icing is laid on.